One of the little joys of loving the old roses is grasping the richness of names & symbolism that they bring into our private gardens. Many bear both the history and the sounds of faraway places. Linguistically, all Rose species - the original wild roses of the world - are titled in Latin, the language of Botany; their innumerable descendants carry names from a wealth of eras, countries, and individuals. 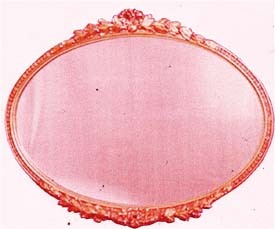 These inherent resonances can add a romantic or poignant, legendary or magnificent dimension to our enjoyment of Rose characters. The variety Grüss an Aachen was hybridized by Philipp Geduldig circa l909 and named in honor of his hometown of Kohlscheid bei Aachen, Germany. Its parents - the white Hybrid Perpetual Frau Karl Druschki and the Hybrid Tea Franz Deegen, a yellow offspring of Kaiserin Auguste Victoria - produced a rather unusual mid-sized shrub. Sometimes carelessly scooped up into the broad category of the modern "Reproduction Roses"..... Grüss an Aachen is an authentic century-old antique and deserves to be given its unique due. The original bush form is a very well-mannered plant comfortably kept in the 3'-5' range; several sports, including a climbing one, have been recorded. This variety is a reliable perpetual bloomer and the blossoms themselves can attain four inches - the very large and very double rosettes open from a coral bud with a golden base. The flowers maintain this exquisite peaches and cream coloration in cool areas and seasons, gradually becoming the cream of old ivory in strong sunlight and heat. As a small to medium bushy shrub, this variety is excellent for bedding - and can also be used as a specimen or in a mixed planting with old-fashioned perennials and herbs. Easily pruned and shaped. Over the years we grew a couple different clones which didn't quite satisfy. At length, we imported a new mother plant in 1999 from France; this one answers exactly to the classic description, and has a noticeable fragrance under good conditions. An extremely pleasing and useful variety, it's certainly worthy of bearing the classic name of Aachen - which echoes over centuries of European history. An ancient town located at the point where the borders of Germany, Belgium, and the Netherlands meet, the French call it Aix-La-Chapelle, and the people of very old Europe knew it by the Latin words "Aquae Aquisrana" in honor of its renowned thermal springs. Such a site in the lushness of the dense primeval forest would undoubtedly have been significant even (or especially) in the mists of prehistory. The area is believed to be the birthplace of Charlemagne (724-814 CE) - whose creation of the Holy Roman Empire out of a vast patchwork of Northern and Central European lands marked the first returning glimmer of light at the close of the Dark Ages. 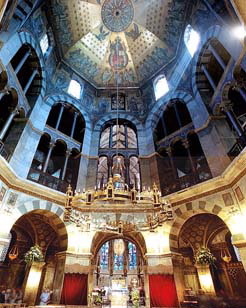 Charles the Great made Aachen his favorite residence in 768 - and in the 790's founded his 'Sacrum Palatum' on the site, placing his throne in an octagonal palace/chapel overlooking an altar to the Virgin. The cathedral which rose around it concentrated the magnificence of this great conjunction of earthly and spiritual power. 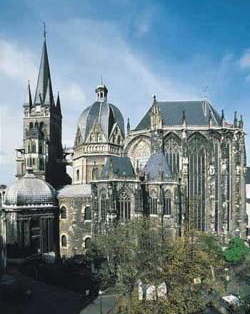 Aachen became the heart of the brilliant Carolingian culture - and coronation site for the Holy Roman Emperors from 800 to 1530. Charlemagne himself passed the historic decree "Capitulare de Villis" (Concerning Towns) which commanded the newly reviving cities of his Empire to plant Red and White Roses (Rosa gallica 'Officinalis' and Rosa alba) in all civic gardens and town estates under his wide dominion. The heads of the great Abbeys were Charlemagne's chief advisers on gardening, and monastery records of the time list 173 herbs (which included Rosa) as well as 16 different fruit and nut trees being sheltered inside these walled bulwarks of civilization. Under the aegis of Charlemagne's shield - 3 golden flowers on an azure ground - a measure of peaceful agriculture and social order was restored throughout his domains. Get a garden! What kind you get matters not." When compared to Aachen's splendid claims to fame, Coburg might seem like just another charming medieval town - although one dominated by an 13th century hilltop castle which may be the finest in Germany. 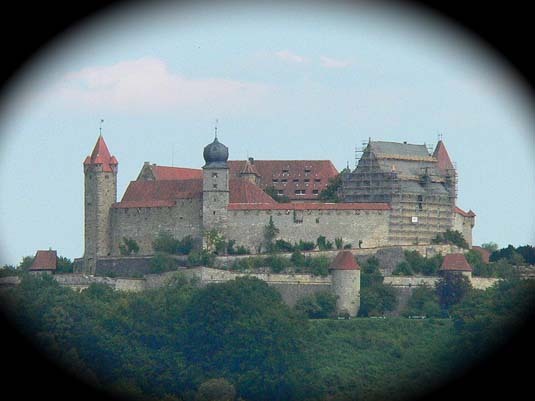 The Holy Roman Empire was a conglomeration of hundreds of principalities, and from the 1300's Coburg was one of its important commercial centers - becoming at last the capital of the Duchy of Saxe-Coburg-Gotha around 1600. After 1918, it was finally absorbed by the state of Bavaria in southern Germany. Perhaps Coburg's most famous son was HRH Prince Albert, Consort of England's Queen Victoria - and the reason the British Royal Family's name used to be the Germanic 'Saxe-Coburg'.....until World War I made the change to 'Windsor' a political necessity. Born in Schloss Roseneau - the sweetly named Castle Rosewater - Albert was advocate for a remarkably progressive agenda during the twenty years he was Victoria's mainstay as her chief counselor and supportive spouse. Presumably Johannes Felburg-Leclerc had more personal reasons for honoring this old city with the lovely rose he hybridized in 1927....... One of the most worthy Hybrid Teas ever named. Its' qualities of color and fragrance place it in the very first rank. The bud of pure deep coral opens to a bloom of orange and apricot, pale pink and creamy yellow, with occasional shadings of scarlet and mauve. Its pollen parent traces back to the Pernetiana Soleil d' Or and on its mother's side it descends from the respected Radiance bloodline. This union produced a beautiful combination of striking sunset tones & remarkable toughness. Grüss an Coburg also has some extra dimension which gives it a subtle magnetism. Perhaps its the exquisite perfume it offers; this is as exceptional as any scent found among the classic old rose types. Overwhelming in its wonderful strength! But beyond this, there's an unmistakable personality that gives it special appeal. 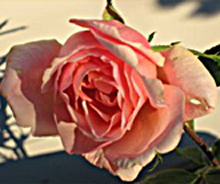 When we first obtained this rose circa the late 1970's, we noticed that most stock of the variety from California nurseries seemed to be infected with Rose Mosaic virus. Looking to get clean material - we imported new budwood from Frau Hella Brome of Sangerhausen Rosarium, Germany in the summer of 1992. Our nursery stock all springs from the mother plants we propagated and brought through quarantine then - and its vigorous beauty has always been a delight. 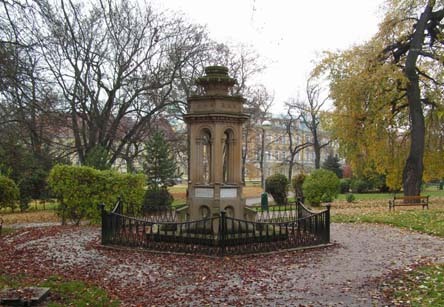 "I made the acquaintance of Beethoven in Teplitz. His talent amazed me. Unfortunately he is an utterly untamed personality." 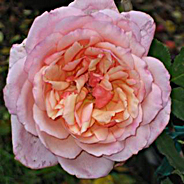 A rose like Grüss an Teplitz exemplifies the kind of complex hybridizing made possible once so many different rose types had been brought together in her seminal collection. 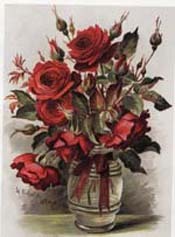 By the time Rudolph Geschwind (1829-1910) was doing his breeding work, he had available for use entire classes of roses which had not existed a century earlier. The conscious creation of new varieties was being systematically pursued. 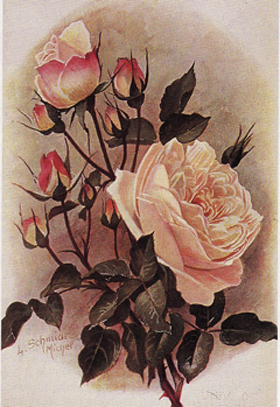 Geschwind had even written a book on the subject in 1864 titled The Hybridization and Collection of Roses. "I ended with God's help today the hybridization of roses." The Teplitz rose is a marvelous deep crimson with velvety petal texture; it holds its color when cut and lasts long in a vase. The scent of the loosely double blooms is delicious. 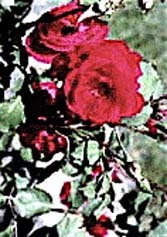 A single bush of this variety will guarantee a constant supply of perfumed red roses to use in any recipe or beauty concoction. Its continuous bloom and admirable constitution make it a great plant for hedging; its habit can be shaped as either a large shrub or a semi-climber. No matter how it is trained, it brings an air of old world romance to every garden it graces.